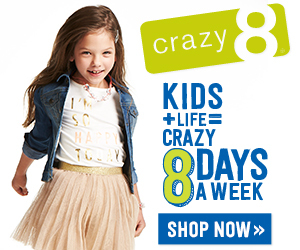 For 2 days only, you can get 40% off your entire purchase at Crazy 8, where they have a huge selection of clothing and accessories for kids, including many very low-priced sale and clearance items. You can find girls long-sleeved T-shirts starting at $4.19 and leggings starting at $3.59. They have hoodies, jackets and pajamas starting at $4.19, too! Boys long sleeved tees start at $2.39, with pants starting at $5.99. Pick up a Minecraft Creeper T-shirt or a Minecraft Creepers Gonna Creep T-shirt for just $4.19. Shipping is free for orders over $75 or $5 otherwise.